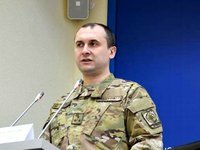 The reports that Ukrainian border guards have recently been getting messages from unidentified numbers warning about the arrival of American special forces in Ukraine are untrue, people should not yield to such provocations, Ukraine's State Border Guard Service said. "Over the past few days many our borders guards, and possibly other citizens as well, have started receiving SMS-messages of a provocative content from unidentified people. The messages were referring to some secret arrival in Kyiv of 'American special forces' and claimed that the Maidan 3.0 issue had been solved and there was no point in [military] service because 'everything has already been decided for you'," the agency's representative Oleh Slobodian wrote on Facebook on Monday. Neither the United States' nor any other country's special forces arrived in Ukraine, he said. "[Ukrainian] border guards at their workplace and positions, honestly and calmly fulfilling the duties vested in them by the people," Slobodian said. The aim of such provocations is to "destabilize the domestic situation and disorient certain social groups and the society as a whole," he said.